SAN TAN VALLEY, AZ — There were no clouds, no threats of rain or hail. So at least for now, no one can explain what happened. But Courtney and Richard Sullenger would like to know how a large piece of ice blasted thru the roof of their home Thursday night and landed in the garage. The Sullenger's live in a San Tan Valley subdivision. Where the desert meets the suburbs in Pinal County. Courtney was at school. So Richard got to discover the mess when he came home around 9 p.m. "I had my motorcycle head lights pretty bright," Richard Sullenger said. "I could just see debris everywhere. When I looked up and saw a hole in the ceiling. It was weird seeing the inards of my house. It was kind of shocking." Richard said he texted his wife "9-1-1 it's an emergency" thinking someone had broken into the home. But then he saw the melting ice mixed with the debris from the roof and ceiling. 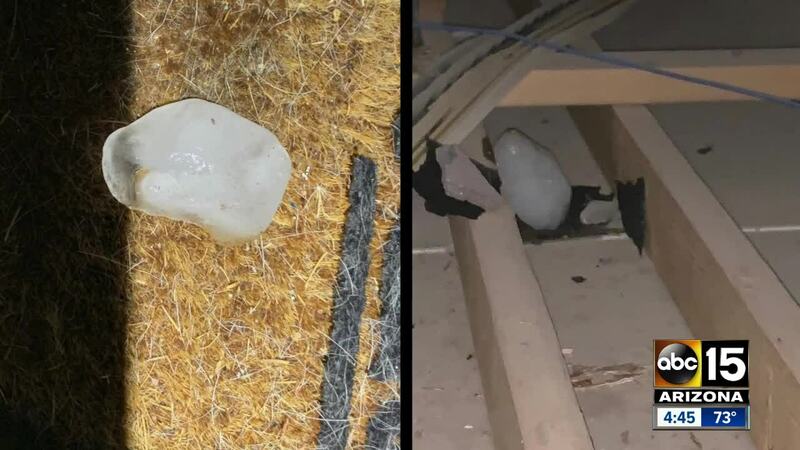 "I got a ladder and saw a very large piece of ice was still stuck in the roof." Richard retrieved it and now it sits in the freezer as evidence. The Sullenger's live 17 miles southeast of Phoenix-Mesa Gateway Airport. But a spokesman says it does not appear the Sullenger's home is directly in the flight path. The Sullenger's did contact the FAA. The agency said it will look into the incident. The National Weather Service says the ice did not come from any weather disturbance. Fortunately for the Sullenger's the ice did not damage the living area of their home. They have three dogs who probably heard everything. But that secret stays with them. Friday a tarp on the roof marked the spot where a cosmic snowball found one home on the edge of the desert. "We were completely lucky in the sense," Sullenger said. "If it hit inside the house it could have hurt the animals and destroyed a lot more stuff."